Nearly 48 million Americans, 15.4% of the total population, lacked health insurance last year, according to a new Census Bureau report. And most of them — 59.4%, to be exact — live in states that have chosen not to set up their own insurance exchanges under the Affordable Care Act, commonly called Obamacare. The exchanges — online marketplaces where people can compare different insurance plans and buy coverage — are the centerpiece of the law, which remains controversial and not terribly popular three-and-a-half years after its passage. The enrollment period opens on Oct. 1. Under the law, most Americans must either have insurance by the New Year or pay a penalty (though officials have said people who are insured by April 1 won’t be penalized, which effectively extends the deadline to buy coverage to mid-March). The law envisioned that most states would set up and run their own online exchanges, with federally-run exchanges as a backstop. However, only 16 states and the District of Columbia have done so; seven more are partnering with the federal government to operate their exchanges. 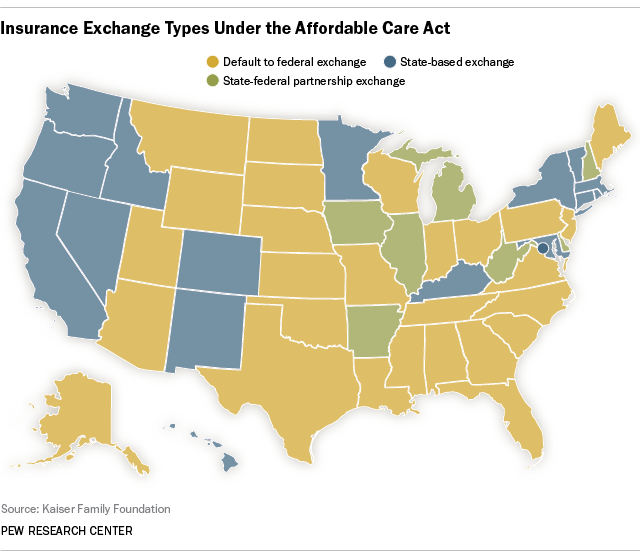 In the other 27 states, people without insurance will use federally managed exchanges to shop for coverage. Those 27 states — many of which have actively opposed the health care law — contain a majority (59.4%) of the nation’s uninsured people; together they account for 54.6% of the nation’s population. Collectively, 16.8% of people in the “federal default” states were without insurance last year, compared with 14% in the states that have organized their own exchanges and 12.8% in the “partnership” states. Much as there’s a deep partisan divide among the American public over the healthcare-reform law (Pew Research found that 73% of Democrats and Democratic-leaning independents support it and 85% of Republicans and Republican-leaning independents oppose it), there’s a clear partisan split on implementation. Among the 22 states (plus D.C.) that are running their own exchanges or partnering with the federal government to do so, Democrats control the legislatures of 17 and hold 18 governorships (or mayorship in the case of D.C.). Among the 27 federal-default states, all but two have Republican governors and 23 have GOP-controlled legislatures. 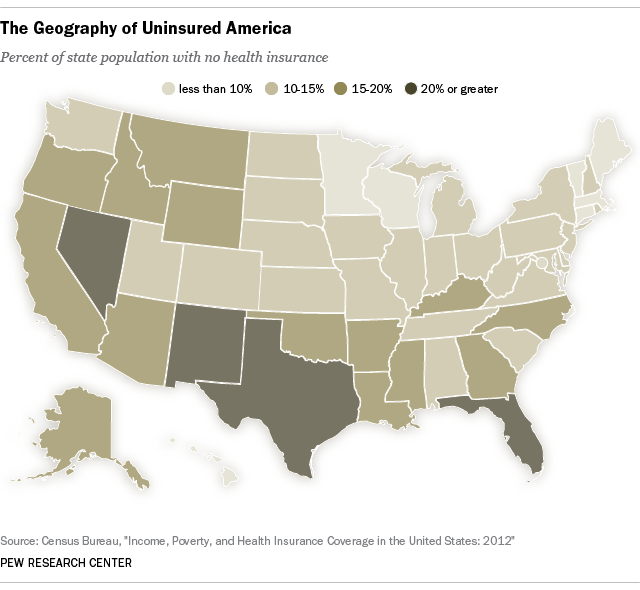 Uninsured rates vary widely throughout the country, according to the Census data, from 24.6% in Texas to 4.1% in Massachusetts (which pioneered its own version of healthcare reform with an individual insurance mandate seven years ago).